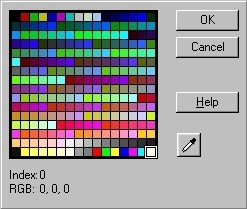 This page is designed to show you all text colors against background colors for the CSB palette. Roll your mouse over the word "change" next to the CSB index number (0 - 255) to see the background change to that color. You can also Click a "Named Color" for your background. They are listed at the bottom of the page. Then scroll to view the text colors against that background to look for compatible colors. OR: move your mouse over QUICK VIEW to see a numerical chart for quick reference. NOTE: because all the text colors of CSB are shown below, it is not possible to choose a background that allows every text color to be visible at one time. I have made a static chart for that purpose! What about the NAMED colors??? There are 140 named colors. Several of the HTML and CSS sites highly recommend moving away from named colors. I STRONGLY recommend you use the hex code for the color available here. Click a color from the list to see the background of this page change. CSB/Trellix Color Charts made by Samantha Conway. Please visit, but do not take the charts. A lot of time went into creating them and the image map.